Carie Juettner was born on Halloween and has been in love with ghosts, witches, and black cats ever since. Carie lives in Austin, Texas, where she teaches seventh grade English and writes strange stories about nature, the future, and things that go bump in the night. 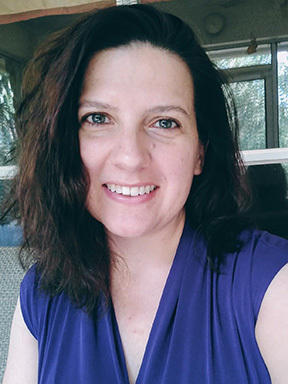 Her poems and short stories have been published in Dreams & Nightmares, Tales to Terrify, Daily Science Fiction, and 21st Century Ghost Stories, among other places, and her novel-in-progress, The Unsettled Spirits of Willingkin Farm, won first place in the middle grade category of the Writers’ League of Texas Manuscript Competition in 2018. When Carie isn’t writing or grading papers, she can be found walking her dog, doing yoga, or reading a book with a cat on her lap and a cup of coffee in her hand. If you haven’t read her story yet, click through to Phoenix, a story that definitely reflects her love of Halloween. Then come back as she shares her insights into the writing process. WOW: What was your inspiration for this story about a girl finding the power to change her world? Carie: It was a combination of things. I wrote "Phoenix" in late July, which is a dry, hot, suffocating season here in Austin. The evening chorus of cicadas in the summer has been a staple all my life. I've loved playing with their shells since I was a little kid. It used to be a game to pluck them off of tree branches or fence posts and try to stick them to a friend or sibling's shirt without them knowing it. However, it wasn't until I was an adult that I saw one of the huge insects actually in the process of emerging from its shell. I took a photo of it (see right) and have been even more fascinated with them ever since. Cicadas find their way into a lot of my writing. I'd also been wanting to write a "subtly witchy" story. That's how my brain named it. I like to write horror, and most of my short story characters don't get happy endings. This time I wanted to write something that still had a hint of magic and mischief, but with a positive spin. I conjured up the idea of Gwen, a well-meaning but naive teenager trying to make a difference in the world by dabbling in witchcraft. 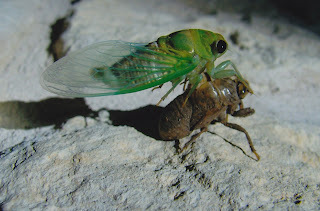 Then I wrote the first line about the cicada shell, pictured a terrible dry spell, and let the story take it from there. WOW: A huge part of writing is rewriting. How did this story change during the rewrite process? And, given the depth of detail, how did you decide which details stayed in the story and which had to go? Carie: I've written flash fiction pieces in the past that started out as longer stories and had to be whittled down to their essence. It's a daunting but interesting task, and one that I suggest every writer try at some point. Forcing yourself to revise a 2,000-word story down to 1,000 really makes you question every word. However, "Phoenix" didn't have that problem. I envisioned it as a flash fiction piece when I began, and at its longest it was never more than 900 words. The revision process was mostly about word choice. I wanted the language to be rich. I didn't care as much if the whole story was explained; instead I wanted it to evoke the senses. I went back over the piece, adding more sensory details where I could and then working on the wording of those details. I wanted a lot of fire imagery, but I was also worried about overdoing it. WOW: For our readers who may find themselves taking a longer work that has to be whittled down to create flash fiction, can you describe your process when you do that? Carie: There are three main things I look for when trying to cut a substantial amount words from a piece: repetition, back story, and places where I over-explain instead of trusting my reader. Repetition is something I struggle with as a writer. I'll use three words or phrases to describe something when one will do. Cutting those extra descriptors tightens up the story and gives me some words back. And back story is always better when woven in or hinted at, especially in flash fiction, so I look for places where I went into detail about something that happened before the current event and find a way to reference it in a different way, like through dialogue. I also look for places where I spell things out for the reader that don't need to be said. If my character's actions or body language reveal her anxiety, I don't need to also tell the reader she's anxious. Of course, all of this is easier said than done. Cutting words from a story you love can be painful. So my last piece of advice is to get a good critique partner. I have a writer friend who is excellent at pointing out the places where I can tighten up my story. Having a second, less emotionally-involved, set of eyes on your writing is a good thing. WOW: What advice do you have for our readers who are new to writing flash fiction? Carie: Start in the middle. There isn't room in flash fiction for a lot of backstory and explanation, so dive right in and give the reader just enough to keep up. Also, try to make every word count. Use active voice and avoid repetition. These are all things I have to constantly remind myself when I write. WOW: Poems and short stories. A novel in progress and also flash fiction. Your writing is so diverse. What are your writing goals for the next year? How do they differ from your long term goals? Carie: Diverse is a nice word for it. Maybe "scattered" or "fickle" is more apt. My long term goal is to write novels. I have one completed middle grade manuscript and another in progress. I would love to get an agent and become a traditionally-published author who spends her time writing, revising, and visiting schools to talk about books and writing. Ah! The dream! So my big goal this year is to finish my second novel and begin querying agents again. However, from August to May, I am a middle school teacher, and that takes up a lot of time and energy. I tend to devote my writing time to shorter pieces and poems that I can finish and send out into the world with more regularity. On that note, I just finished a science fiction story called "Dream On" that I hope finds a home somewhere this year. Sue--Thanks for doing this interview, and for providing the link to Carie's story. Carie--I got immersed in your story. The sensory details, the way you painted the house (with cicada-like images), made me thoroughly enjoy your tale. I too am a middle school teacher, so I know how much your job drains you during the school year. Teaching is the best job in the world, but it's also the most exhausting. Thank you for your kind words, Sioux. :) And best of luck on your querying! What genre is your manuscript? Carie--It's historical fiction. How about yours? Great job on this story. It sucked me right in and I savored all those sensory details. Plus, my extended family lives in Killeen not far from you so I know well of that dry, dusty heat that lingers in the summer! We went to Waco during a summer vacation a few years ago and I swear my daughter almost passed out from the humidity (we live in North Carolina, which is much more moderate). You did a great job of offering sound and practical advice for those wanting to write flash fiction. Good luck with your manuscripts and bravo to being a middle school teacher! That has got to be one of the hardest jobs in the world. And great interview questions, Sue! Thank you, Renee! I'm glad the heat imagery in my story resonated with you. Yes, middle school teaching is exhausting but fun. I have great students.